SM Supermalls team up with Globe Telecom Inc., as they boosts free internet services in selected SM malls nationwide which started November this year. More shoppers and mall goers will be able to access everything they need online to make their mall-going experiences enjoyable, seamless, and convenient with a speedy and reliable internet connection. Being #AlwaysConnectedAtSM, customers can check out movie schedules, tune in to their social media accounts, book a ride and get first dibs on the latest dining spots and fashion finds that SM malls have in store for them. Mall goers only need to connect to @SMFreeWiFi via their mobile device, tablet, or laptop to enjoy one hour of free internet service. 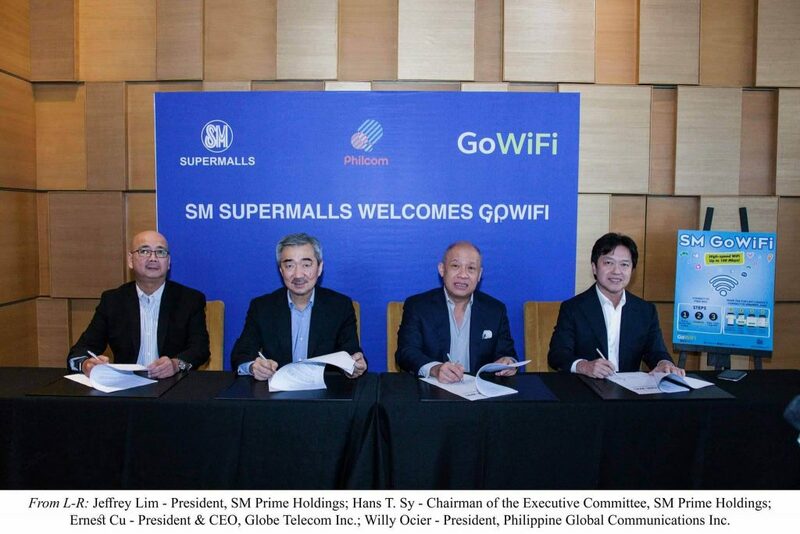 To make the fun last longer, SM’s GoWiFi Auto will also be available for customers to experience up to 100Mbps of high-speed internet connection with affordable promo packages starting at P15/day. All they need to do is open their device’s WiFi settings, connect to @GoWiFi_Auto hotspot, and follow the easy step-by-step instructions on the pop-up screen. Being two of the most loved brands, SM Supermalls and Globe have teamed up to provide mall goers access to high-speed internet services, and together, bringing new and extraordinary experiences in SM malls across the country.